DUCHARME, GUILLAUME-NARCISSE (baptized Vincent-Guillaume-Narcisse), office holder, businessman, politician, and philanthropist; b. 3 Jan. 1851 in Châteauguay, Lower Canada, son of Vincent-Valéry Ducharme and Marie Denis; m. 6 July 1880 Marie-Mathilde-Adélia Rivet (d. December 1925) in Sainte-Cunégonde (Montreal), and they had 14 children, five of whom outlived their mother; d. 30 April 1929 in Montreal and was buried in Chambly, Que. Guillaume-Narcisse Ducharme began his classical studies at the Petit Séminaire de Sainte-Thérèse, which had been founded by his uncle, Abbé Charles-Joseph Ducharme*, and he pursued them at the Petit Séminaire de Montréal from 1863 to 1865. He then left school to work as a clerk in the general store of a cousin in Danville, where he lived for four years before moving back to Montreal. After various jobs in fancy goods shops, he opened a dry goods store in 1881, but he gave it up soon afterwards to devote himself to public affairs. 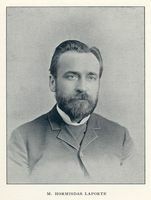 Since 1878 Ducharme had been secretary-treasurer of the Sainte-Cunégonde school board, a position he would hold until 1903. Appointed postmaster in 1882, he would retain this office for 15 years. In 1884 he took on the job of secretary-treasurer and clerk of the village. As an office holder, Ducharme had a good deal of influence on the municipal council, according to Édouard-Zotique Massicotte*. He participated actively in the development of this Montreal suburban municipality, whose population of about 5,000 in 1881 doubled over the next decade. The village underwent many changes during this period: streets were paved, water mains and sewers were put in, and electric street lights were installed. There was also a Grand Trunk station and a branch of the Banque Jacques-Cartier, where Ducharme was the manager. He probably acquired his wealth through real estate – by 1902 he owned a lot of property. Although his ideas were not universally shared, as an enterprising man he overcame every obstacle. 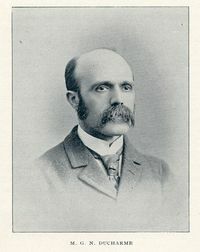 Favouring the annexation of all the suburban municipalities by Montreal, Ducharme resigned as an office holder in 1891 and ran for a seat on the municipal council. He was defeated, however, and returned to his previous employment. Two years later, he was successful in his second attempt. At that time he was also president of the local section of the Association Saint-Jean-Baptiste de Montréal. His influence extended beyond Sainte-Cunégonde. A member of the Chambre de Commerce du District de Montréal and the Montreal Board of Trade, he was also a director of numerous companies, including Auer Incandescent Light Company Limited, Standard Light and Power Company, and Citizens Light and Power Company. In 1896 Ducharme scaled back his activities for reasons of health. He gave up his offices as councillor and postmaster and spent some time in Europe. Having returned to Canada, he was elected mayor of Sainte-Cunégonde in 1899. He carried out the first stage of his plan for annexation by integrating the municipality into the Montreal streetcar system. After resigning in 1902 to attend to his personal affairs, he moved the following year to Chambly, and would watch the annexation of Sainte-Cunégonde to Montreal in 1905 from a distance. Elected to the municipal council of Chambly in 1914, he was to serve as its mayor from 1915 to 1918. Despite his important role in municipal affairs, Ducharme’s name is mainly associated with the financial sector. 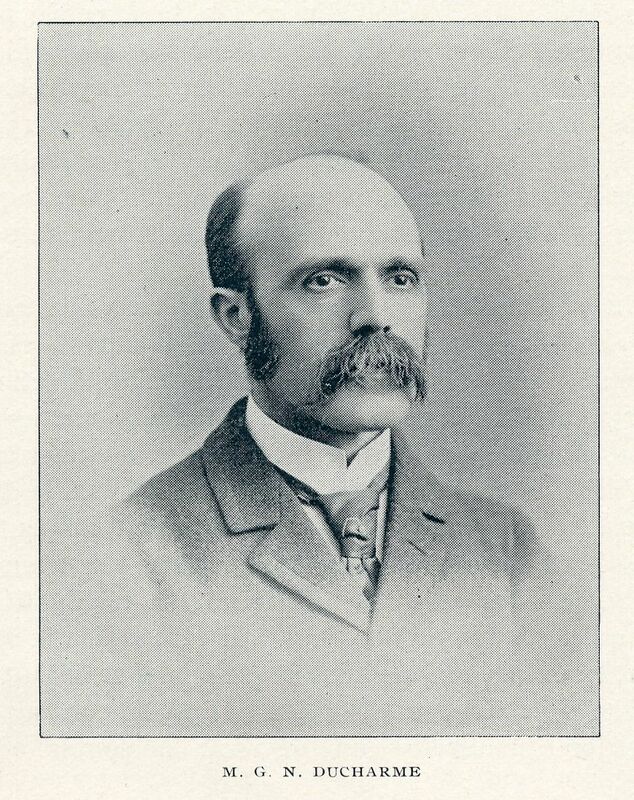 He was named to the management of the Banque Jacques-Cartier in 1899, at a time when it was in serious difficulty [see Alphonse Desjardins*], and he succeeded in persuading customers to leave their savings in this French Canadian enterprise, which he revived under the name of Banque Provinciale du Canada. He would serve as its president from 1900 to 1907. Ducharme also was president of the mutual benefit company La Sauvegarde from its beginnings in 1901. It too was suffering from French Canadians’ lack of confidence in their financial institutions. In order to give better guarantees to the policy holders, its founder, Philorum Bonhomme, developed a plan to transform it into a share capital company. Ducharme agreed to invest in the new entity and he would remain its president for the rest of his life. Bonhomme was also supported by leading French Canadian businessmen in Montreal, including millionaire Frédéric-Ligori Béïque*, and politicians such as Henri Bourassa* and Napoléon-Antoine Belcourt*. According to data from 1910, the principal shareholder of the Life Insurance Company La Sauvegarde (the name it had adopted in 1903) was a prosperous merchant from Saint-Timothée, Narcisse Papineau, who bought $50,000 worth of shares. Ducharme owned $20,000 worth. La Sauvegarde counted mainly on patriotism, as Bonhomme advised its agents. Its sales grew quite steadily from 1903 to 1912, but more slowly for the rest of that decade. Some shareholders were dissatisfied with these results. Dividends were slow in coming, while profits were lower than the Canadian average. Moreover, the construction of a new ten-storey head office in the heart of Vieux-Montréal in 1912 and 1913, which consumed most of the paid-up capital, was not well regarded by the federal superintendent of insurance, who had been overseeing the company since it obtained its federal charter in 1911. As a result, some 15 years after the company had been founded, a group of shareholders were considering selling it to anglophone interests. Ducharme and J. N. Cabana, who was then the manager, addressed the problem and reviewed the operation of the agencies as well as the internal administration and investment strategy. This reform proved fruitful. From 1920 to 1924, the revenues and the number of policies in force more than doubled and growth continued until 1929 at an average annual rate of nearly 13 per cent. A Conservative in politics, Ducharme was approached several times to be a candidate for that party. He nonetheless used his own money to finance the Montreal Le Devoir, a nationalist daily founded by Bourassa. The principal shareholder of the publishing company Imprimerie Populaire Limitée, Ducharme helped on two occasions to revive the newspaper. He also supported mutual aid societies, schools, and hospitals. Guillaume-Narcisse Ducharme was a superb example of a self-made man. From humble beginnings, he became wealthy by investing in the residential development of the Montreal suburbs and increasing his capital by diversifying his interests. As Bourassa wrote a few days after Ducharme’s death, he also had “a highly developed sense of social responsibility.” His major achievement was the Life Insurance Company La Sauvegarde. In 1929 it ranked third among personal insurance companies founded by French Canadians in the province of Quebec, after the two large mutual aid societies, the Société des Artisans Canadiens-Français and the Alliance Nationale [see Sir Hormisdas Laporte*]. It ranked first, however, among share capital companies. La Sauvegarde would continue to be controlled by the Ducharme family until 1962, when it was purchased by a management company acting on behalf of the Desjardins movement. ANQ-M, CE601-S19, 6 juill. 1880; CE607-S7, 20 juill. 1848, 4 janv. 1851. Desjardins Sécurité Financière, Centre de Documentation (Lévis, Qué. ), Doc. de La Sauvegarde. Le Devoir, 22 mai 1926; 30 avril, 3 mai 1929. La Patrie, 18 sept. 1902. BCF, 1929: 448–49. Canadian men and women of the time (Morgan; 1912). Compagnie d’Assurance sur la Vie La Sauvegarde, Rapport annuel (Montréal), 1909–30. Encyclopaedia of Canadian biography . . . , vol.2. É.-Z. Massicotte, La cité de Sainte-Cunégonde de Montréal: notes et souvenirs (Montréal, 1893). Newspaper reference book. “Numéro-souvenir,” La Vie (Montréal), 41 (1962), no.8. Prominent people of the province of Quebec, 1923–24 (Montreal, n.d.). [Télesphore Saint-Pierre], Histoire du commerce canadien-français de Montréal, 1535–1893 (Montréal, 1894). Benjamin Sulte et al., A history of Quebec, its resources and its people (2v., Montreal, 1908), 2: 667–68. Léon Trépanier, On veut savoir (4v., Montréal, 1960–62), 4: 55–57. Jacques Saint-Pierre, “DUCHARME, GUILLAUME-NARCISSE,” in Dictionary of Canadian Biography, vol. 15, University of Toronto/Université Laval, 2003–, accessed April 26, 2019, http://www.biographi.ca/en/bio/ducharme_guillaume_narcisse_15E.html.